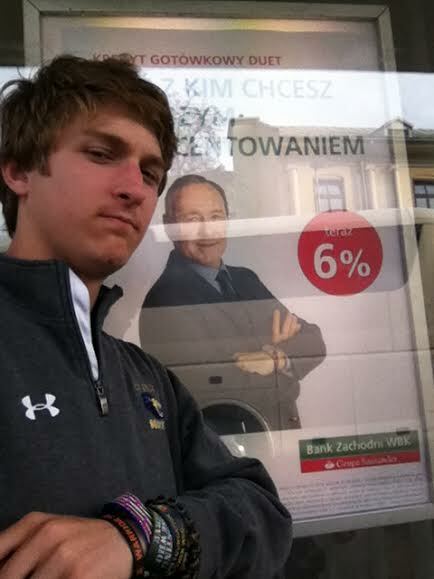 Frank Underwood's fame has spread to Krakow (this is him, not his alter ego, Kevin Spacey). Before I begin, it’s worth my giving a massive spoiler alert, because I am going to be giving away a lot of the plots of both of these shows. With that out of the way, we can examine the pros and cons of these two political titans. At the onset, there is the obvious difference in how the two shows are released: House of Cards is released at once (and therefore more conducive to marathons [more on that later]), whereas Scandal is released one episode per week. Although this certainly builds up more suspense, it also runs the risk of losing viewers (also more on this later). In this first matchup, I have to give the win to House of Cards. For a little more context, I remember when House of Cards first came out, I was trying to extend its lifespan by watching one episode every day. Once Russo was murdered (if you disregarded my spoiler alert and proceeded, I won’t say who did it, but it rhymes with Plank Tunderwood), however, I proceeded to finish the entire season in a night. Fortunately, this happened to have been on a weekend, so the resulting sleep deprivation wasn’t too consequential. In the runup to the second season’s release, I remember seeing a state legislator from Minnesota tweeting something along the lines of “House of Cards is being released on Valentine’s Day? I hope my wife understands.” Yes, it does have that kind of power. I know this firsthand, because I spent my entire Valentine’s Day this year in bed watching all 13 episodes. This is particularly impressive because I also distinctly remember that I needed to start packing for my trip to Israel, but that was delayed by a day to watch Underwood’s continued quest for the presidency. The only downside to this release was that it launched at midnight…Pacific time, so rather than waking up at 3 to commence watching it, I woke up early the next day to binge watch the entire season. As for Scandal, I liked it before it was cool to like (as in, 3 or so years ago), but I randomly decided to stop watching it until a few months ago, when I restarted the whole show. I had a vague memory of the fact that the CIA Director was assassinated in his car (turns out this memory was correct), so I was expecting that for a while. However, the fact that I was able to watch the entire show despite remembering major plot twists (such an the assassination attempt on Fitz) without being bored shows that this remains a great show. In terms of politics, there’s no question that both are great. It’s impossible to not be overcome with schadenfreude every time David Rosen’s career comes to a screeching halt thanks to Pope and Associates, and Frank Underwood’s quest for power has become legendary in our halls of power (and in a city where every senator looks in the mirror and sees a president, that’s really saying something). These facts notwithstanding, the fact that Fitz begins Scandal as president removes any form of suspense that the show has at the onset (at least to me). We know he’s going to win the election that is constantly being flashed back to. However, the constant conflict presented by the election rigging in Defiance in every character (except for, of course, Hollis Doyle) does manage to keep it interesting. House of Cards begins with Frank being let down by a newly-inaugurated president, and the fact that the audience is taken along with Frank as he serially murders his way to power is something that Scandal can’t rival, even with Fitz’s reelection bid. It was obvious Fitz would win from the start because if he were to have lost the election, there would be no conflict to continue the show. House of Cards continues its supremacy in the realm of politics simply because it’s so much more believable (if you’re a supremely paranoid individual, B613 might seem like some kind of group that holds sway over every power maker, but for us saner members of society, this seems like a bit of a stretch). Given the reputation politicians have, is it really hard for the average American to imagine that a real-life Frank Underwood would in fact have no problem pushing Zoe Barnes in front of a Metro? And for those inside the DC bubble, is it that hard to believe that something like that can happen in one of the darker Metro stations and go (presumably) unsolved? For someone like myself, the scene with interns slaving over Underwood’s education bill was a refreshing thing to see in a TV show because it made me realize that I’m not alone in this world in finding things like this interesting (not that I ever really doubted that), and Scandal is, for the most part, lacking in that same nuance that House of Cards has from time to time (although as it has been pointed out, Underwood’s efforts to broker a compromise from the center are inconceivable in our day and age). I also remember reading (however, despite repeated searches, I couldn’t find articles confirming this, so don’t take my word on this) months ago that Lamar Alexander pulled a Frank Underwood with one of his primary opponents. What does this mean? In the show, Frank showed up at his primary opponent’s house and got him to drop out, and as I recall, Alexander did something similar with one of his primary opponents. There also was the House race in North Carolina this year in which Clay Aiken’s primary opponent died just after an extremely close primary that was awaiting a recount. Remember that Underwood is from South Carolina, so it’s possible his tactics were imported in his neighboring state (although I say this entirely jokingly). Underwood was also brought onto the big screen…at the White House Correspondent’s Dinner (aka Nerd Prom, aka the best prom). Olivia Pope has yet to receive this celebrity treatment, just saying. But Matthew, wait. Olivia Pope was based on a real person, and Frank Underwood is just…a made up congressman. I’m sure that those out there who defend Scandal’s supremacy are thinking this. Yes, it is true that Olivia Pope draws inspiration from Judy Smith (who consults for the show), who was a “fixer” for George H.W. Bush. However, as far as I can tell, that’s where the similarities end (despite some interesting voicemails she received), so for all intents and purposes, she is as fabricated as Underwood. Both shows certainly have a lot going for them, but because of the history House of Cards made as a Netflix-only show that people actually want to watch and because of this, shows like Arrested Development got a second chance (I completely fabricated this logic, but it seems sound). Olivia Pope also doesn’t speak to the camera in the same, eerie way that Frank Underwood has made legendary. For all of these reasons mentioned (and many unmentioned, including how I reference the show here and here), I unequivocally maintain that House of Cards is absolutely a better time investment than Scandal. As for where Alpha House fits in, I’ll save that for another post, but in the meantime if you agree or fundamentally disagree with my logic here, by all means let me know. Frank Underwood’s fame has spread to Krakow (this is him, not his alter ego, Kevin Spacey). Maybe the fact that I got this picture makes me slightly predisposed to like House of Cards more, but maybe not. BOTH SHOWS ARE AMAZING! I will admit that I love how Frank taps his ring but I also love how Olivia goes off on a verbal rant that leaves me rewinding just to make sure I didn’t miss anything. Good stuff here.